The Maryland House of Delegates on Friday approved a gay marriage bill, positioning Maryland as the next state to legalize such unions. The measure cleared the House with a narrow 72 to 67 vote. Lawmakers approved two amendments to the measure aimed at shoring up support. One amendment, approved Thursday evening, pushed back the bill's effective date from October to January 2013, ensuring that gay nuptials do not begin until after the November election. Opponents have vowed to put the issue up for a public vote. The second amendment, passed earlier on Friday, would block the bill from taking effect until litigation over a drive to repeal the law is settled. Several amendments aimed at weakening the measure, including one which would have put the measure up for a public vote, were defeated. Republican Delegate Wade Kach, who two days earlier voted against the measure in committee, told colleagues that his mind was changed during that committee's hearing. Kach said he was touched by the testimony of a lesbian couple who were barred from sharing custody of their child. “As a pro-life legislator, I believe that it is my responsibility to make certain that children are taken care of. This child, if this couple were to be able to have a civil marriage, would be taken care of. This child would have the rights that a child of a traditional married couple would have. So, I left that hearing a changed person,” he said. Supporters faced their greatest obstacle in the House, where Democratic leaders last year shelved a vote due to lack of support. 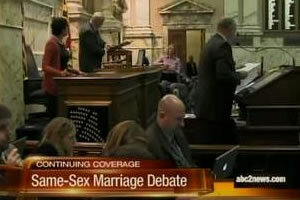 With that hurdle cleared, Maryland is poised to become the eighth state to legalize gay marriage. The bill now heads to the Senate, where supporters outnumber opponents, then to the desk of Governor Martin O'Malley, who introduced the measure last month in his legislative package. UPDATE: Vote count was originally reported as 71 in favor due to a technical glitch.